This Garageband course for iPad is designed for the home musician who wants to record audio tracks, add instruments and effects, mix the tracks and export them to any one of numerous outlets. The course will show users how to record from external sources such as vocals or instruments, add internal instrumentation and build multi-track recordings. Whilst dealing primarily for the iPad user, the Garageband course will also cover many recording techniques which are applicable to the more widespread world of audio engineering such as mixing, editing, MIDI, compression, looping and sampling. 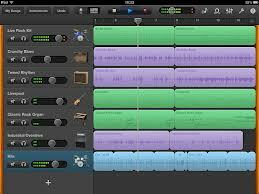 If you are interested in going on the waiting list for the next GarageBand Course, please contact us with your details. Between sessions 1 and 2, you will have the opportunity to use Garageband in your own surroundings, try the techniques covered in session 1 and make some recordings of your own. Included in the Garageband course is also a 1-hour, personal session with the tutor, to discuss any questions or issues you may have following your initial recordings. Focusrite iTrack Studio hardware package. What is it? How will it help me?